To me it has flown by. I am on a weird roller coaster of obscure meats, writing, varied questions from anyone I meat (aahhh…), daily advice and constant education. In fact just this weekend I ran into a mates brother who enthusiastically (and a few beers deep) blurted out on seeing me- “Dude! I’ve been dreaming about you bro! I can’t believe you ate possum! I can’t think of anything to stump you!” It was quite hilarious whilst being entirely surreal at the same time. It’s a great ride, that I’m definitely growing from which is amazing, but it’s also daunting and incredibly overwhelming at times. Gaining the body and health you truly want doesn’t need to be hard: “Geeky weight loss and health solutions made simple”. I hope that makes sense to most of you, and resonates with many. Getting in shape, looking and feeling great, getting healthy in all areas should be simple eat clean, exercise regularly, de-stress and get enough quality sleep. If you’re unsure about these things then research and seek out the answers. See my easy summary posts here, here and here. This is something I do on a daily basis. Which is exactly what I’m doing at the moment, as being interviewed on TV is acres outside my comfort zone and I’m slightly sh*tting myself at the prospect. But, it’s a challenge and a learning experience so I’m diving in head first, (Gulp…) but I’m doing my best to get prepared. How else am I pushing my own limits and comfort zones? The meats alone are taking me to places I’d never thought I’d go. I can safely say that as a teenager, seeing the odd possum (that is the occasional possum, not the ‘sandwich short of a picnic’ possum), around the house, I would never have thought I would one day eat one! Nor did I think I’d down a bunch of lamb’s testicles. 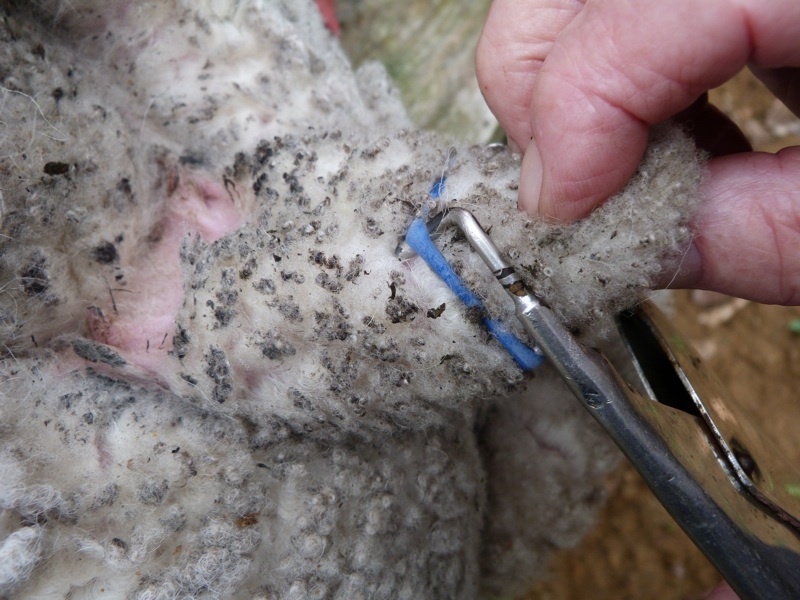 In fact I can remember my old pet lamb Rufus (yes please cue laughter at the Kiwi having a pet sheep…) having his testicles slowly removed by the process of extremely small rubber band. Not once did it occur to me to say to dad “We’ll keep an eye out for when they fall off hey, I reckon they’ll be tasty to eat. And nutritious to boot I bet.” That didn’t happen. However, I’ve now eaten some sheep’s balls! This is not Rufus- however, this is exactly what happened to him! Too much?? And I continue to reach out there. It goes on and on right; horse meat, crocodile, and raw fish! I’m a different beast when it comes to eating compared to the person I was 10 years ago, and it continued this week. Facing the late arrival of a special order for this week, the doors to meat week 26 opened through the dark and often misunderstood form of liver and kidneys. Not my own, but from a lamb. 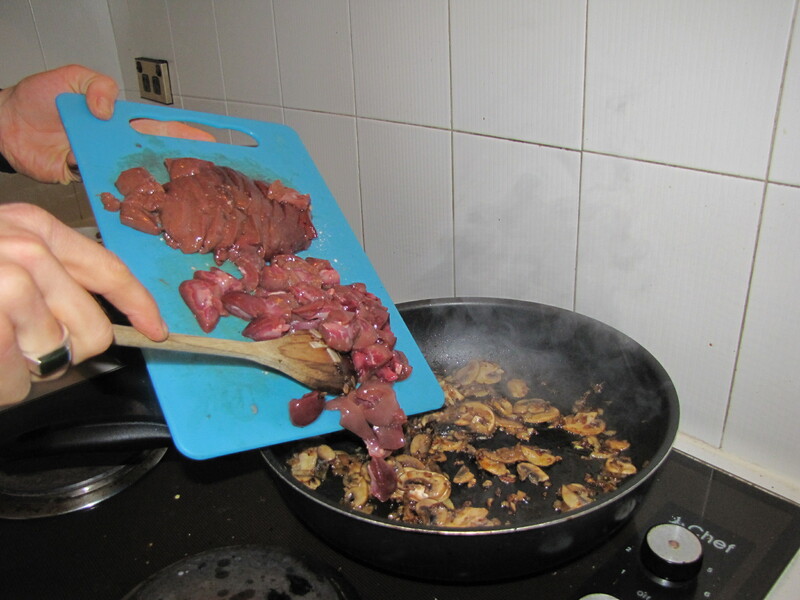 This week I ate some lamb kidneys and liver! I’ve only ventured into these meats once, and that was from the lovely little Easter bunny I ate earlier this year. They were bite sized at most and beautiful once sautéed in garlic and ghee. When confronted with a much much larger version, the lamb’s organs, I was not overly confident the result would be the same. Who out there has eaten this before? Were you an anxious first timer? Or have you been raised on offal like this? I put my reservations aside and went in search of a recipe. As much as I was apprehensive about eating these lamb’s organs, the nutrition geek in me was keen as hell to get some of this super healthy and nutrient dense stuff into me. 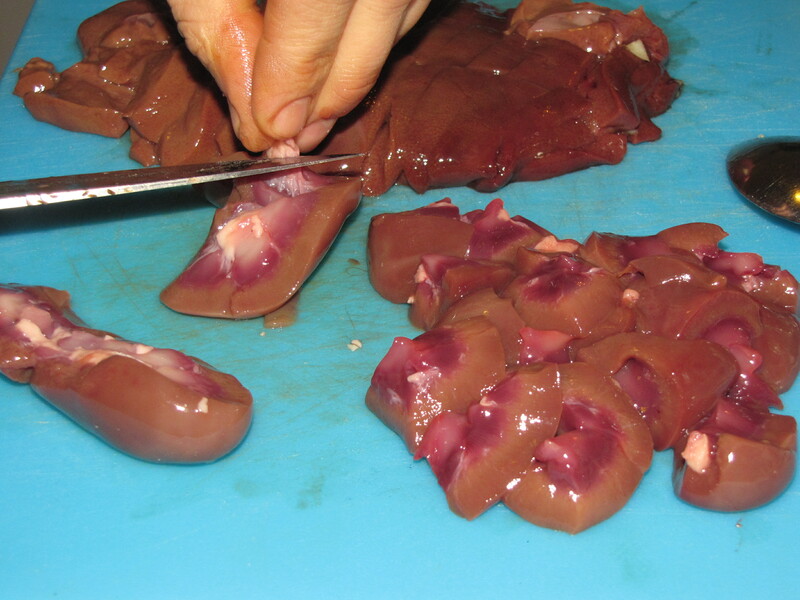 Lamb kidney: a great source of lean protein, iron, zinc, selenium, phosphorous and jammed full of essential B vitamins and vitamin C.
Liver and kidney contain much less fat than flesh, while having much more bang for your buck in terms of micronutrients (minerals and vitamins). These should definitely be a part of every health diet. How did you cook it and what did it taste like? 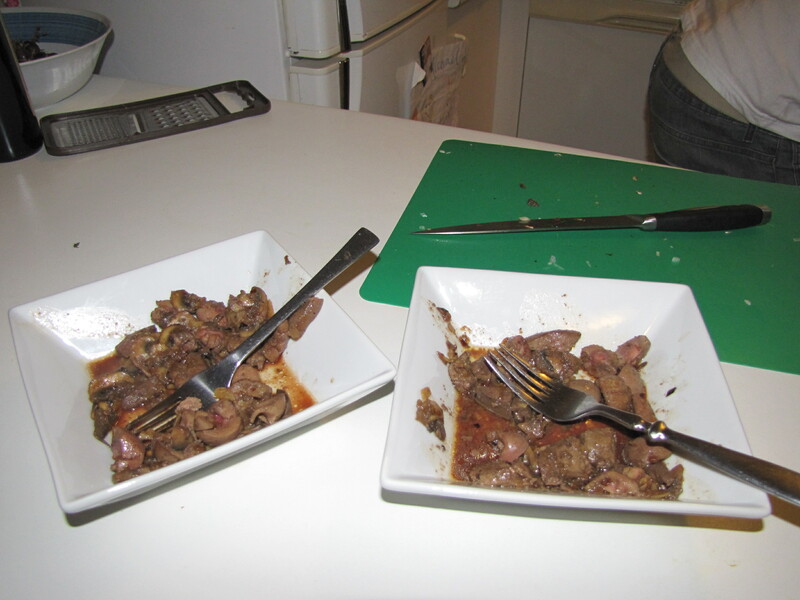 Once these had sweated off somewhat I increased the heat and added the offal to cook and form a meal (of sorts). I had decided on purchasing that this would be a dinner entree, with some lamb flesh, leg steak, to make the main course. So I took a wild guess at the readiness of the kidney and liver creation and dished up. Weird how a smell can manifest years later in a taste. Albeit an unsatisfactory one! NN was worse. She thought she loved this stuff, certainly her mum’s recipe involving bacon and tomatoes, but this was a definite no-go. Her plate hardly lost any contents. I persevered and got through a good serving, but I didn’t enjoy it. It went back to the kitchen and I was instantly thankful for my foresight to buy a main meal for dinner! Safe old lamb leg steaks! Would I have it again? So for me, a bit of an anticlimax for the half way point! Then simply cook the camel to taste, over a couple of days. Sure, no drama there! Ha! Certainly no Bedouin feast this week! But with the right encouragement, support and funding I’m sure I could make it happen! Thoughts? Backers? Keen to make it happen? Tune in next week when we enter what I’m ingeniously calling: Phase two- the tricky half. This from a reader, slightly disturbing but classic!